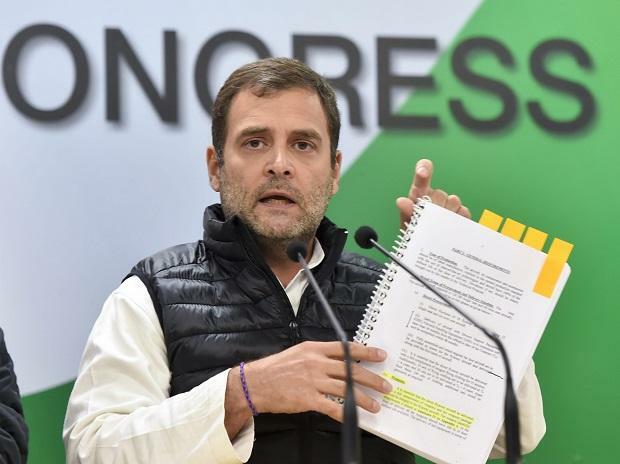 Stepping up his attack on the Modi government over the Rafale deal issue, Congress president Rahul Gandhi on Saturday urged all Indians to ask Prime Minister Narendra Modi and his ministers the questions he posed in Parliament on the fighter jet agreement with France. "RM (Raksha Marti) spoke for 2 hrs in Parliament, but she couldn't answer the 2 simple questions I asked her," Gandhi tweeted. He also posted a video of the two questions he posed to the defence minister in Parliament. Gandhi had asked who gave the offset contract to Anil Ambani and whether the defence ministry officials had raised an objection when the prime minister carried out a "bypass surgery" for the deal. He had asked Sitharaman to reply in a yes or no. Posting the video on his Twitter account, Gandhi said: "Watch & SHARE this video. Let every Indian ask the PM & his Ministers these questions." With his tweet, Gandhi used the hashtag "2SawalDoJawab". The Congress has alleged irregularities in the deal for 36 aircraft and claimed that the Narendra Modi government is buying them at a price much higher than the one that was being negotiated by the previous government. The party has also been accusing the government of favouring Anil Ambani's firm in the deal. However, the government, as well as Ambani, have rejected all the allegations.